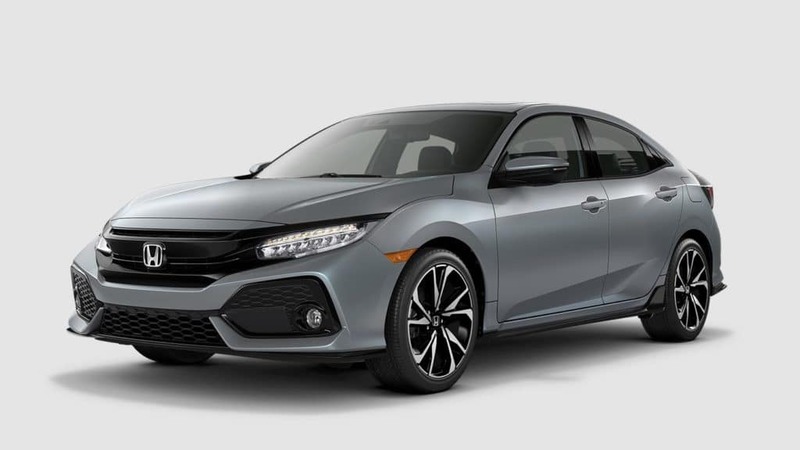 The 2019 Honda Civic Hatchback is sporty, versatile, and a legend on the road. It offers drivers an excellent ride quality, impressive fuel economy, and great features inside and out. A perfect combination of form and function, Edmunds.com says the Civic “delivers a large, versatile cabin for people and their things, with good rear legroom and clever storage solutions.” Coming in five trim levels, there is a model right for every type of driver. The entry-level LX is well-equipped with features that bolster comfort and provide helpful conveniences, both for everyday driving and for longer journeys. 12-volt power outlets makes it easy to keep your devices charged up and ready to go. And automatic climate control keeps everyone in the cabin supremely comfortable. As one of the safest vehicles on the road, drivers can expect a long list of active safety features that ensures the Civic Hatchback is performing at its best, even in inclement weather and slippery road conditions. These features help the Civic maintain good tractive control with the road, come to a stop more safely, and allows drivers to check their surroundings before backing up with a multi-angle rearview camera. The LX doesn’t skimp out on technology either. In the Civic Hatchback, you can stay entertained and connected. Stream your favorite musical artists with Bluetooth technology and when the Civic Hatchback slows down, as in a merging situation the audio volume will automatically soften with speed-sensitive volume compensation. Every model of the Civic Hatchback also comes equipped with Honda Sensing, a suite of driver-assistive technology that helps drivers drive more safely. The package includes state-of-the-art systems that warn, prevent, and mitigate impacts and incidents. The Sport model is the next in the lineup and is a great option for drivers who love to drive. With performance enhancing features such as sport pedals, an underbody spoiler kit, and leather-wrapped steering wheel, the Sport model gives drivers thrills behind the wheel. The EX model is a great mid-level trim to consider for drivers who want more technology than the entry-level offerings. With the EX, drivers will see a larger, upgraded audio touchscreen, smartphone integration, and even a power moonroof to let the wind in your hair. The EX-L Navi picks up where the EX leaves off and adds more touches of luxury to the high-tech cabin. Heated front seats keep you warm through Michigan’s bitter winters and a leather-trimmed interior is comfortable, durable, and sophisticated. At the top of the line is the Sport Touring model. It offers drivers the best of both worlds—high performance features with the most technology and amenities inside. A satellite-linked navigation system guides you to your destination while an upgraded audio system with 12 speakers and a subwoofer offers crystal clear sound quality.